When you offer a service to any individual or company, then you need to bill them and get paid for your work. The document used to provide all details regarding the job done, cost of the parts used for service, labor charge etc. is called the invoice. Ok, I agree with your question. What is a work order then? It is also called as job order, or work ticket that is created to document the details of the work need to be done. Usually, the service person who attends a particular request will carry this document to know the work to be completed to achieve the request. I am sure you understood that work order sheet would contain the task details to be accomplished. Now, your question is how work order and invoice is related? I will explain. Both are created to complete a particular task. Therefore they become an integral part of work. 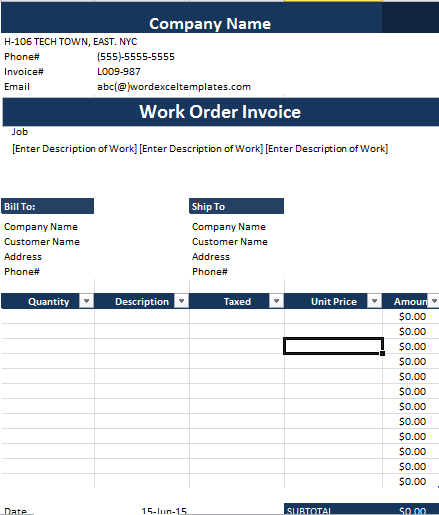 Work orders created can also contain the cost appropriate to make it a work order invoice. The service person can refer this document for the tasks and the client for payment and for every business person like you to record your work and transaction in one go. Sounds good right? Yes, it is. So let’s move on to understand the components, do and don’t’s about the work order invoice. 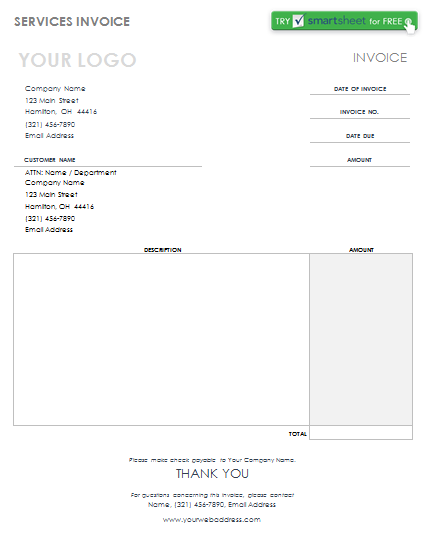 Before we move forward with details, I feel glad to let you know that you can download pre-made work order invoice template for free from here. There are numerous templates available in different format including word, excel, and PDF. All these templates have been collected keeping different business and services in mind. You will find all details given and all you need to do this download and customize per your business need. The work order is primarily required in places where technicians are sent to attend work at the client’s location. Typically if you are in services business offering services like plumbing, electrical, car service, machine maintenance, carpet cleaning, pest control, and many more. Yes, I can list a variety of services that require workforce to accomplish the task. Such work happens in the team if your business is significant. 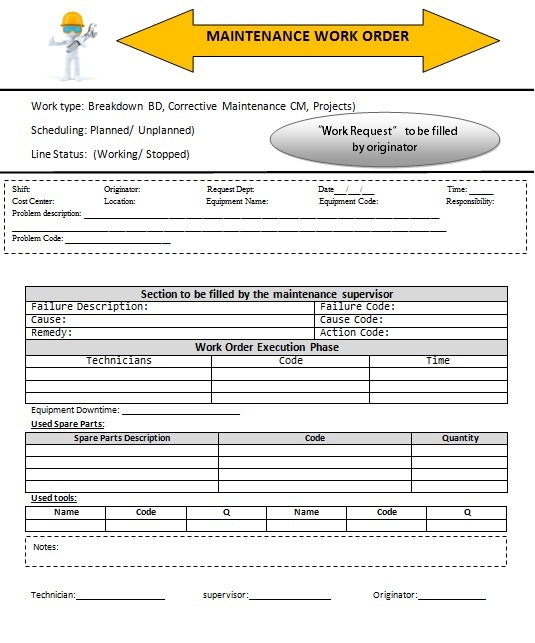 Then you need to use the work order template either in a word, excel, or PDF to fill specific mandates. The term receipt needs to be understood clearly before we proceed further. The receipt is a document given to acknowledge completion of a specific task. This document will contain the details of the work and the cost incurred for the job. The payment will be made based on the invoice, and this will act as a paper confirming the same. A work order receipt need not be as detailed as an invoice with break up for all cost details. However, some necessary information must be included to confirm the work done and the payment received. Are you curious to know the essential components of a work order invoice? Yes, then continue reading. You will find a detailed explanation of what these names refer to and merely give your service details and personalize the same. Organization Name – This place should be filled with your company name. In case you have a logo, then insert the same in this section. Bill To: As the name implied here you must mention the name and contact details of the client or the person for who you are providing the services. Also, if you do work in volume, then create a unique ID for each customer or work and mention the same here. Ship To – Sometimes bill to and ship to may be the same. It may differ also. The ship to is the address where the product or service gets delivered. You may do work in a different site and collect the bill from the admin Such situations will need both billing address and shipping address details. Work/Job/Task/Detail/Description – You can call it any name, the details about the job is listed in this section. This must be as detailed as possible to make things clear to both the individual who performs the task and the person who will pay for the work. Quantity – The total number of hours worked, or some parts purchased for the material or anything related to the work to be calculated as mentioned in this column. Tax – Tax column is given to calculate the tax against each work done or the material purchased. This column can also be written with a formula based on the country you live and can generate amount once you enter the details. In order to avoid confusion you can insert a column before this call Taxable and mention Y for yes, and N for no so that individual who read the invoice will understand whether it includes tax or not. Then checking the tax amount will become easy for everyone. Misc – Here you can write any other details you wish to provide. It can about the discount that you want to mention. Any offer you want to give to attract more customers you can do those things in this section. 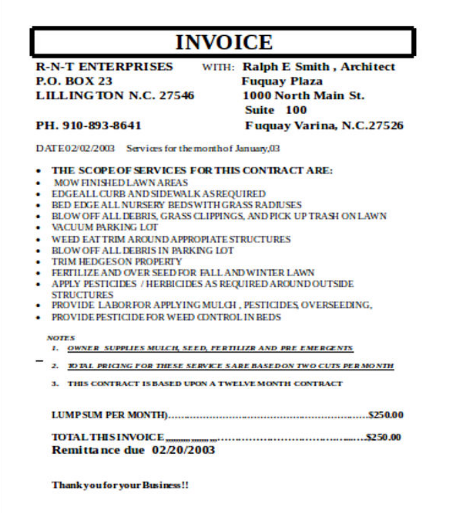 It is only a proof of payment done, but also a receipt will give an excellent impression to your client about you. You can refer them for understanding your tax details. Always it will help you to analyze several details and thus you can increase your business in a focused manner. The client will feel glad about your professional approach and will provide you with more jobs. Also, will refer your service to all their contacts. This is one kind document where you can create a request for maintenance and include cost as well in that to request payment. Which means a form designed to fulfil maintenance request of the client is used as the invoice as well. 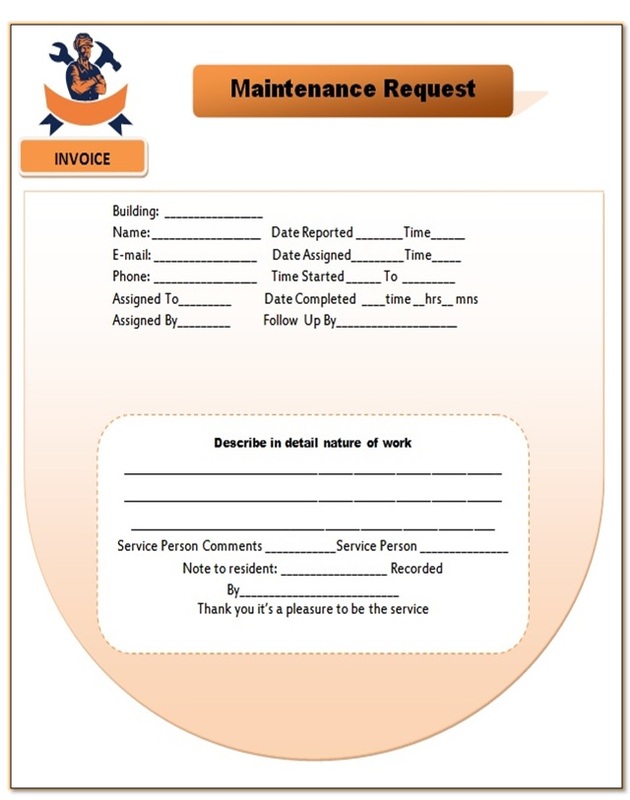 Maintenance request form will have the usual details including the company name, date, address and signature. Apart from that, the request form will have the aspects of the work required by the client. It will be listed based on the priority and date for completion will be mentioned. Rates can be included in another column adjacent to the work, and hence at the end of work completed the client can make payment. Construction business happens in stages, and several orders come at one time from customers and new order as well. Therefore maintaining a work order in place is required to track the work done without any omission. Every work you perform is recorded for future reference. The work order is one such document that will contain the details of the work received and allocated to a resource. 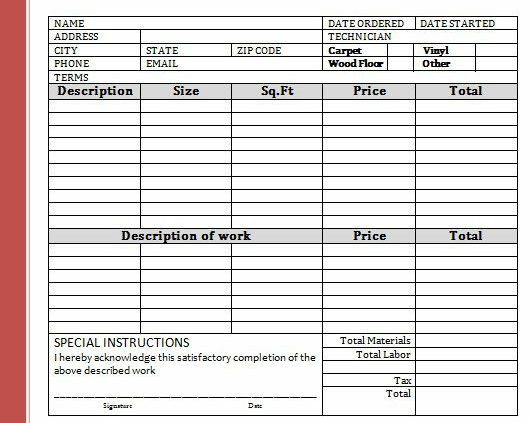 Using an excel format work order will help you to create a one-time sheet and enter different information without much waste of time. Start with the company name, logo, and work order number with the date. Then give the contact details and the shipping address information. Now in a table format mention all the work details, work hours, quantity and cost. Calculate the total amount and include tax if any. Finally, mention the mode of payment and append your signature. Yes, it is easy. However, if you are not an expert in excel and have no time then use the work order template in excel. 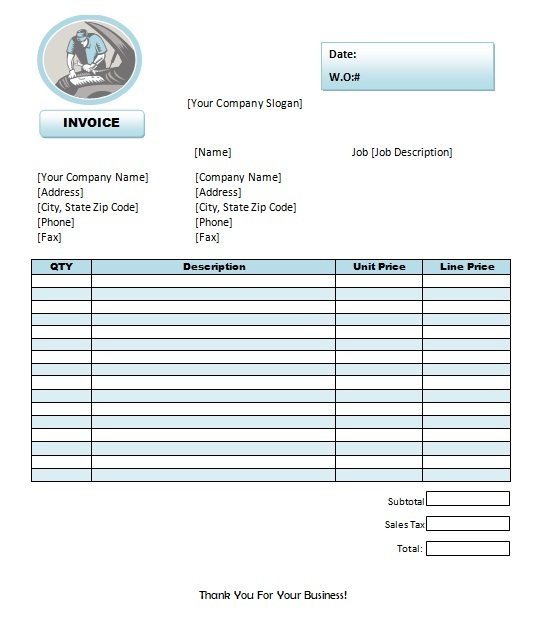 This template is ready to use and quickly download it and enter your details at the appropriate sections and print them. Any work that comes to organization is picked by via calls or mail through the customer care executive. He will, or she will collect the details and put them in a document called work order. The field technicians carry this work order to the client place, and they complete the assigned task. The same copy is given to the client for verifying the job accomplishment as per agreement. Then the technician leaves the customer place. The admin or the finance team checks with the customer team for the work order copy and check with the technician for completion of the job. After this, the finance or the admin team prepares the invoice. This can either be included in the work order or create a new one. It will consist of the cost of each work done. Work Order Format In Word will contain the details of the customer such as phone number, address where the service is required. A work order number for reference. Date of work received and time before which action needs to be completed. Description of work and details about the same. Instructions to the service technician and signature. The work order is not only created for service jobs, but for all maintenance related work. Yes, when you install any product at your client place, it requires regular maintenance. For such regular cleaning and service work, the order is mandatory to be created. Duly fill the maintenance work order with all details and hence end to end service can be provided. Make sure to give the number to the work order based on the order in which the maintenance work is to be done. This will showcase your professionalism and also you will not miss any job. Always remember to carry the work order during the time of field service to ensure all work done per listed in the work order. Remember to get signed by the customer to ensure completion of all work on-time without any gaps. You can use that to invoice your client if you can include the cost details in the same. Prepare a work order with all details in one go. You can use the template for any construction related work. Yes, imagine all the possible work related to the construction business. List them one by one and categorize them under subheadings. Provide a column for cost as well. You can convert the work order as invoice at later point. You will have general conditions like equipment rental, raw materials, labor charge, permits, license, tax etc. Mention all separately under the general heading. Next specifically include details for woodwork, electrical, plumbing, and construction. Under each subsection cost with a reference that job can be filled. For example, under construction, you will mention cement work, brickwork etc. Under electrical work includes, fitting, repair etc. Likewise, under each subsection specify the details. Here you can also cover the materials used and their cost. One such comprehensive template is provided for your perusal. Download the same and fill details in all those columns required. You can keep this template for any kind of construction service you offer. There is no need to prepare separately. Quickly fill details for the particular job and complete the task. In a nutshell, a work order is prepared to complete work one at a time and to finish the entire task. It helps workers to keep track of their work. Also, allows the client to feel satisfied with the job. Further enables the business owner to collect payment and have a record for their reference. Therefore, this one work order template will resolve all issues and help the organization to offer service in an organized and hassle-free manner. Irrespective of the services you offer, feel free to edit the templates based on your need. Retain the basic structure of the template to save your time. You can quickly fill details and move forward in your task.